On April 12, 1912, the indomitable ocean liner Titanic sailed and sank, but 100 years later people are still fascinated by the fateful journey and stories of people on its maiden voyage. Fifteen years after the latest Titanic movie became a blockbuster, a new 3-D version of James Cameron's "Titanic" is being released. The conversion from 2-D took a team of 300 people working 60 weeks. It's expected to appeal to a new generation of viewers as well as those who saw and loved the original love story with Leonardo DiCaprio and Kate Winslet on the big screen. Look for it in your local theaters. The most notable new Titanic museum just opened in Belfast, Ireland, city where the ship was built and launched. But if you can’t get there, check out special exhibits and Titanic museums in the U.S. to become immersed in this stunning event from both an historical and personal standpoint. 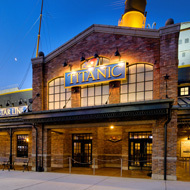 Pigeon Forge, Tennessee—Experience what it was like to walk the hallways, parlors, cabins, and Grand Staircase of the Titanic while surrounded by more than 400 artifacts directly from the ship and its passengers. View an underwater eight-foot replica of the ship as it currently rests on the bottom of the Atlantic Ocean.